Great personal deep dive by the author into the Waterboys song material. Excellent read. 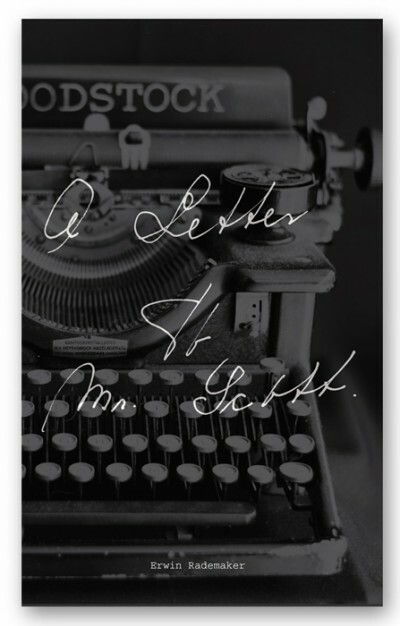 A Letter To Mr Scott is a Waterboys related book that is not a biography in itself. It is a deeply personal view of what The Waterboys songs mean to the author and that is what makes it a truly original opus. The author has managed to put his heart and soul into it as it has been written to express his intense love of the Waterboys music. The book takes the form of an open letter to Mike Scott, though it deals solely with the music, and it begins with a whole list of songs that have had a profound meaning to the author, and long-time Waterboys fan, Mr Rademaker. In order to prepare himself to write what turns out to be a captivating and quite magical book, Erwin secreted himself away in Newgrange, County Meath, and over a number of days in seclusion, he listened to every single Waterboys song and jotted down notes and drawings. The opening section of the book makes for enchanting reading as with each song we are taken on a journey through the author’s life, his memories and the imagery and emotions that each song evokes for him. 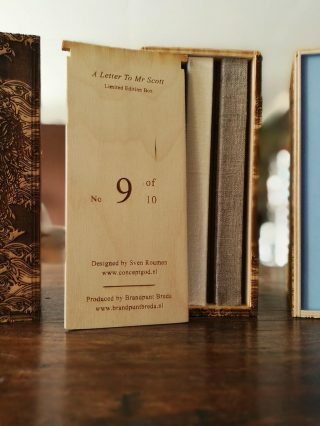 The middle section of this meticulously crafted book is made up of pieces of prose written by a number of Waterfolk who were asked by the author to answer in writing the simple question ‘What Does Music Mean To You?’ (And this web author also made a small contribution and was very honoured to do so). These pieces of writing are of varying length and are also wonderfully unique in their style and give great insight into each contributor’s individual perspective on what having music in their day-to-day lives means to them. There then follows an extensive photo section containing colour and mono images of song lyrics with the author’s handwritten notes and drawings alongside. There are also several photos of the Waterboys on stage and many other photos of various scenes that are described in the first part of the book, as well as family shots and more that relate to specific Waterboys songs in the author’s perception. Do you know the feeling that when you finished reading a book, you are not able to get back to real life and the only thing you want to do is read more and more and more? That’s what happended to me after reading A Letter To Mr Scott. It is a world of Waterboys-music-things you don’t want to leave – and it is a challenge to go through the songs yourself, finding out what the lyrics and the music mean to you. The book is full of rich variety. It is a book about music, it is a book about feelings and emotion, it is a book about love. It is a book you will love. Erwin did a great job. He created an appointment with… Mr. Rademaker. Go and meet him. A Letter To Mr Scott is a fantastic journey through the author’s beautiful soul and the music and lyrics of Mike Scott. Erwin’s book is adorned with outstanding drawings made by Veronique Castellanos and beautiful artwork by Sven Roumen. A part of the book is made of a brilliant mythological poem written by the author and of unique responses to “What does music mean to you?” question by over thirty contributors. My first words after reading it were: “beautiful, unique, touching, uplifting, masterpiece; Erwin’s feelings and his beautiful soul show up as pure as an angel. Mr Rademaker is a very talented writer. 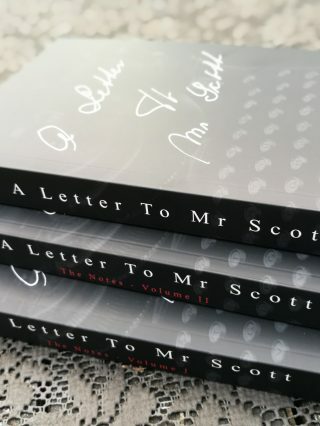 Il libro A letter to Mr Scott merita di essere letto da ogni fan dei Waterboys, è un magnifico viaggio dell’anima dell’autore attraverso la musica e i testi di Mike Scott, libro impreziosito dai favolosi disegni di Veronique Castellanos e da un poema mitologico composto dall’autore. Inoltre ci sono più di 30 risposte alla domanda “Che significato ha la musica per te?” fornite da persone differenti provenienti da tutto il mondo. Il sig. Rademaker è davvero uno scrittore di molto talento. By writing A Letter to Mr Scott, Erwin Rademaker has achieved that rarest of things: he’s created something that is totally unique. Unique in its approach; unique in its contents; unique in the spirit that makes each page leap to life. And yet, it is something that anyone and everyone can relate to!! Though the recipient of the “letter” is, nominally, Mike Scott, it is nothing other than a love letter to music of the Waterboys… If the concept is quite original, the author’s choice of means to make it come into being is equally if not more original still…. But the scope of the book goes further than the author’s own love of the Waterboys music… He invites other people to share what music means to them,and that makes up another very enjoyable part of the book, as each contributor’s story is unique in what it tells, and how. To me, though it demonstrates brilliantly how music can weave itself intricately into our life, this is a book that is about far more than music. It is about love and life, and about what makes life meaningful… But then, maybe this is precisely what music is about…. What reaches the stillness of Everyman’s soul? Causing the most callous to weep, the most defeated to believe in victory, and the seed frozen in Winter to bear forth new life? In this work by Erwin Rademaker, the author lays open his own soul trying to uncover the one single language that unites us all. Music. This comfortable and accessible work will remind the reader of more than one personal truth, reliving poignant moments experienced in wonder. Sit back and enjoy, find yourself transported and delighted to reconnect to those very Earthbound feelings that somehow make us feel we are part of a vast and wondrous Universe. And, even more, to feel excitement at what is yet to be revealed. The Pan Within always has the incredible effect of taking my soul to another place.”, writes the author, Erwin Rademaker. “My soul to another place” could have been the title of this incredibly well written letter. Rademaker has soul. He writes with cogent passion. 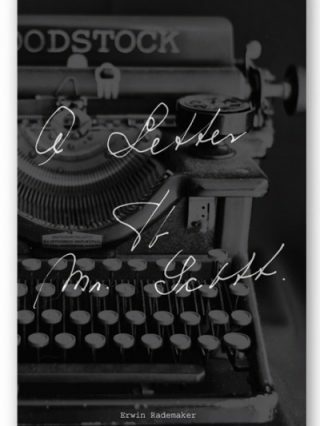 His letter to Mr. Scott brims with a soulful nuance. He loves The Waterboys. But more than that, he loves what The Waterboys bring, and have brought to his journey as a listener. Every single one of us love music. Music is the blood in our souls. It is a timeless novel we read for the first time over and over again. The author takes us, dear readers, on a “journey beneath the skin”, to quote Mr. Scott. It’s about something real. Even if you aren’t a fan of The Waterboys, yet, you will find this book fascinating. If you are a fan, you will find this book to be a joyful reminder. One of my favorite writers is Milorad Pavic’. He was a professor at the University of Belgrade. He was often compared to Gabriel Garcia Marquez because he used Magical Realism. My favorite work is Landscape Painted With Tea. It is written in the most peculiar way. It is a crossword puzzle. Some chapters are across. Some chapters are down. You may read the across first, or, the down first. No matter how you read it, the message is the same. It is an exotic read. As I was reading A Letter to Mr. Scott, I had the same sensation. This is the kind of work you can leave on the bedside table. You can open it to any page and begin. Here is why. It is in itself a magical, caring expression, of one man’s journey into the music and words of a magical soul. Mike Scott is The Waterboys. His music and words are spells cast upon the listener. Erwin Rademaker wants to share these spells with us dear readers. He wants to give us the joy, mystery, and beauty he has found through the “letters” Mike Scott has been writing to listeners since 1983. The fact that the book is filled with beautiful art, pictures, drawings, and ancient words, is one more reason you would want it on your bedside table. Erwin also invites other fans of music to share what music means to them. This is truly “a journey under the skin”. When I read the earlier reviews, I felt as if “the grass has been mown beneath my feet” (a poor translation of the Dutch proverb “het gevoel alsof het gras onder mijn voeten is weggemaaid“)!. However, I couldn’t do it better. After picking-up my copy of the book a few weeks ago, it costed me half a day and a full night to read The Letter, as I went back sometimes to let it sink in my head. It came to my mind during the reading, all the idea’s we both had long time ago, working together in Rotterdam and the exchange of visions we had, as well as our love for music. Of course I’m not completely unbiased, but still emphasizing the work you’ve done, the drive, research, dedication and spirit to achieve this, just along all other activities you were involved in, makes us proud! Look forward to the next book you’re working on. Erwin, I’m proud you’re our kin. I’m dinamite and I don’t know why!!! I first saw the Waterboys some 25 years ago one Thursday afternoon at Glastonbury festival. In those days festivals were free!!! I fell in love with the lyrics that day. Mike Scott and the boys have lived with me ever since. Over the years through the winding roads of my life Mike has always been there – it seemed like he was guiding me through lifes beautiful journey. I once followed him to Findhord one dark and windy night – only to wake up in his old house (yellow sands guest house) in his guitar room!! God had truly blessed me that day!! Saw Mike playing in universal Hall that weekend – he took my breath away and touched my very soul. More recently whilst playing at the Royal Albert hall I managed to jump up onto the stage and steal a hug from Steve and Mike. And that’s me – at the RAH hugging Mike on the front cover of “kiss the wind”. The thought of Erwin’s book filled me with excitement. Did he feel as I do? Like he new Mr Scott. The book has been like a friend to me, I find it hard to put it down, reading each page with anticipation. It’s so beautifully written, clearly from the heart which you can feel and touch on each and every page. Mr Scott you blessed us with your giunius mind and i thank you for all that you have done and continue to do. You have been touched by God. Mr Rademaker, your not far behind. Bring em all into my heart!! !